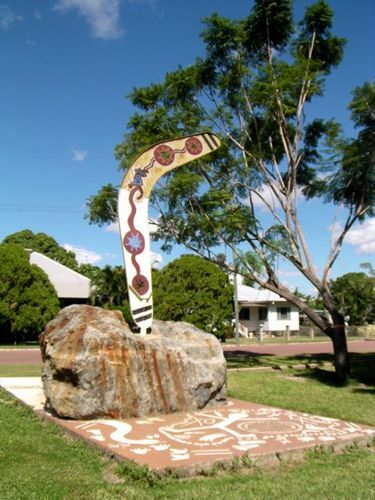 Free standing large boomerang commemorates Jupiter Mosman who discovered gold at Charters Towers in 1871. Jupiter Mosman, whose tribal name is unknown, was born in north-western Queensland and, as a small boy, `came in` to Kynuna Station. There he was `acquired` as George Clarke later wrote, by Hugh Mosman who gave him his non-indigenous name. Soon afterwards the Mosman brothers and John Frazer sold Tarbrax to the McIntyres of Dalgonally and set off for the Cape River diggings. They visited Ravenswood where they became friendly with the prospector George Clarke and decided to look for gold around the Seventy Mile Pinnacle (Mount Leyshon). Clarke described Jupiter riding behind Mosman, strapped to him and never allowed out of his sight. The party rode through the gap on the western side of what is now called Towers Hill and camped on a creek where, in December 1871, Jupiter discovered the gold-bearing quartz of the North Australian reef: the first mine of the Charters Towers goldfield, the field that ensured the survival of north Queensland as a European settlement. Jupiter parted ways with Mosman in 1891 and went droving and prospecting. Jupiter eventually retired and was allocated a house at the Eventide Home for the Aged in Charters Towers. Jupiter died at Eventide on 5 December 1945. Four city councillors followed his hearse, along with a number of townspeople and Eventide residents.